Learn to be a better machinist in 30 minutes or less at Eastec 2015! Come to Siemens booth #2012 at the show and one of their machining experts will show you how easy it really is! SINUTRAIN functions exactly the same way as an actual Siemens CNC system. This means you can test all of the operating modes of the graphical user interface step-by-step. Not only is SINUMERIK the top-performing machine tool control in shops worldwide, Siemens also offers training that’s second-to-none. You’ll quickly learn that, with Siemens onboard your machines — anything is possible. Register to attend EASTEC — compliments of Siemens. Simply participate in one of Siemens in-booth demonstrations during the show and you’ll receive your trial version free-of-charge! Triumph Structures – Wichita, a Triumph Group company, brought a unique challenge to the engineers at Zimmermann (Novi, Michigan) and the solution has yielded various benefits to this major supplier of aerospace components. As Harry Thurmond – President at Triumph Structures – Wichita explains, “We had requirements for spars and stringers that often reached 22’ in length, but we also do a variety of production jobs on smaller sections such as bulkheads. This creates the need for fast, reliable and adaptable machine tools.” In this current mode of manufacturing, Triumph Structures – Wichita considered a variety of options to expand on the capabilities of their existing milling machines, some of which had been in operation for decades. Triumph Structures – Wichita specializes in complex, high speed, monolithic precision machining and sub assembly of Aluminum and Titanium structural airframe components often with wall thicknesses down to 0.020 inches. 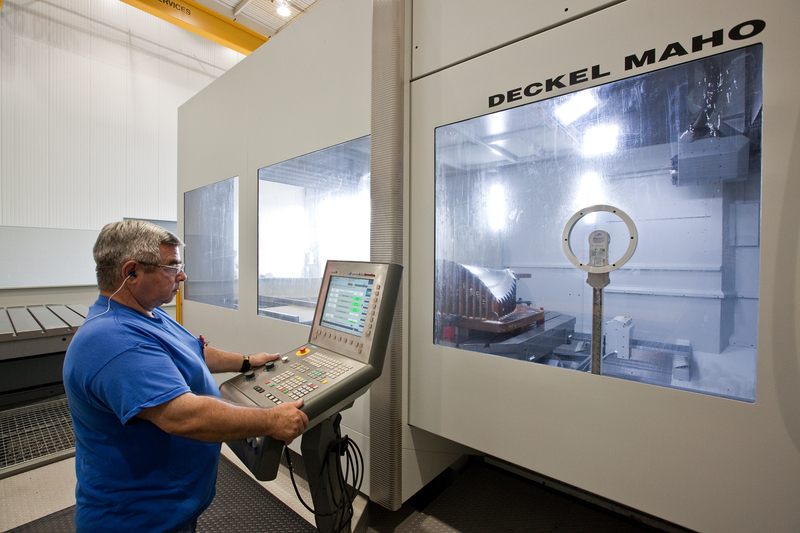 Currently, 21 individual 5-axis machining centers are resident in this facility, with a maximum length of 960 inches. Over 20 other 3-axis and 4-axis machines complete the machining capability for aluminum structures. Triumph Structures – Wichita runs a gamut from build-to-print precision machining of aluminum and hard metal, small-to-large parts, especially aircraft wing spars, Skins, bulkheads, and landing gear components. 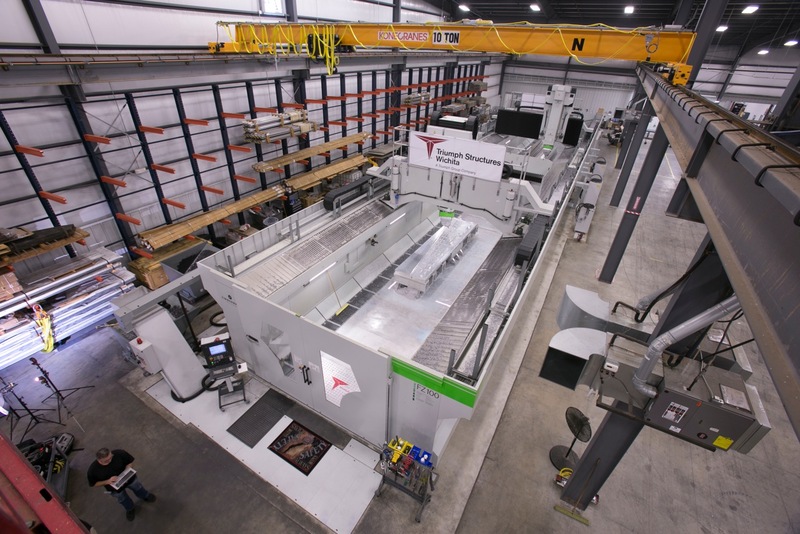 While the machine capabilities at Triumph Structures – Wichita were clearly substantial, it was determined that a need existed for a particular machine that could be used to serve multiple purposes. First, the machining of very long parts with volumetric compensation to manage material expansion and the tool tip position over a very long cutting cycle, often multiple days, was required. Triumph Structures – Wichita has extensive experience in this area, given its market focus. However, it was posited that a single machine might also be capable of running multiple smaller parts or operate in twin fashion, occasionally using the entire machine bed with both heads working the same part in tandem. Clearly, the latter scenario would demand extremely close attention to collision avoidance between the gantries, as well as the consistency of surface machining at the points where the twin machining heads intersected. 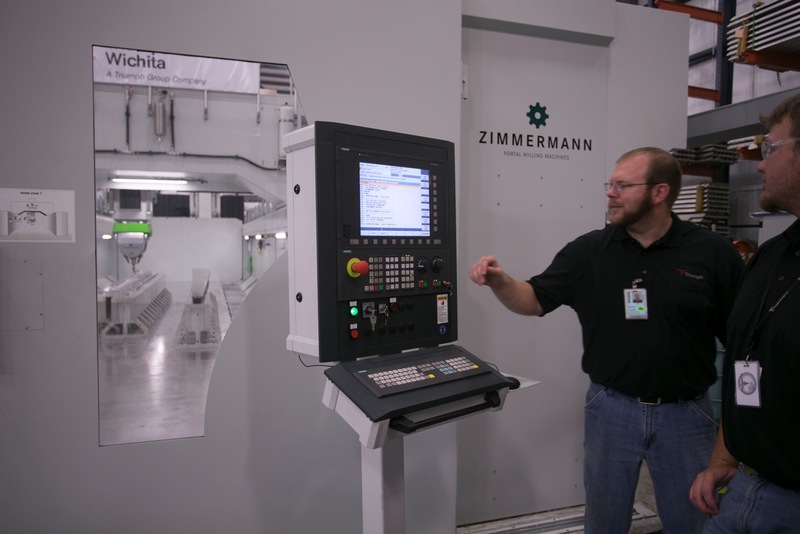 For the requirements presented by Triumph Structures – Wichita, the optimal machine necessitated that Zimmermann, a longtime partner and portal machine supplier to Triumph, modify its popular FZ100 machine with twin gantries, each equipped with a three rotary axis head and independent Siemens Sinumerik 840D sl CNC. The individual head machining time scenario was further detailed. If the maximum time was achieved using an A- and C-head with infinite C-axis, the alternative A-B-C integrated rotary axis head could accomplish the same work in 25 percent of that time. In designing the final work envelope and machine structure, Zimmermann engineers determined the best solution was a removable break wall built into the midpoint of the machine bed, which would allow completely independent operation of the entire machine, literally running as two machine tools in one. 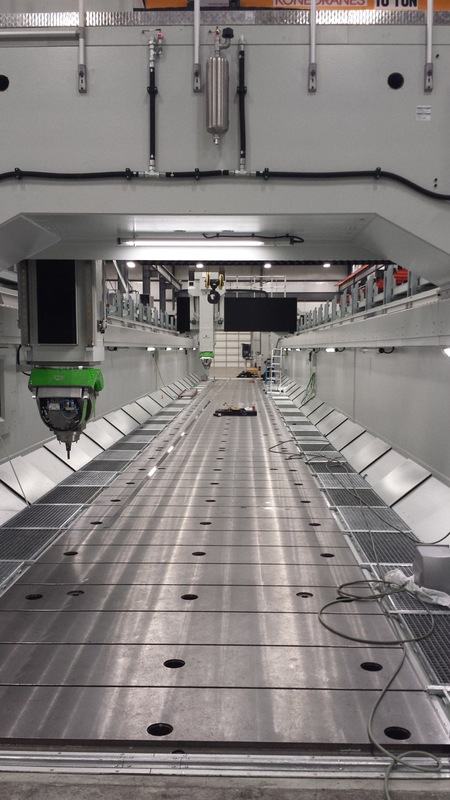 When removed, the machine bed could accept parts up to 960 inches in length and process them using the twin heads working in tandem and monitored for total collision avoidance by the two CNCs onboard. Owing to the unique volumetric compensation feature of the Siemens CNC, where the execution of the machining is based upon the actual tool tip position, the point of intersection for the twin heads was found to be an easily addressed and resolved issue. Surface integrity on the workpiece would be preserved, while machine and operator safety would remain paramount. This machine was built over a period of eighteen months. Parts were sent to Zimmerman to be fully tested prior to being erected onsite at Triumph Structures – Wichita. 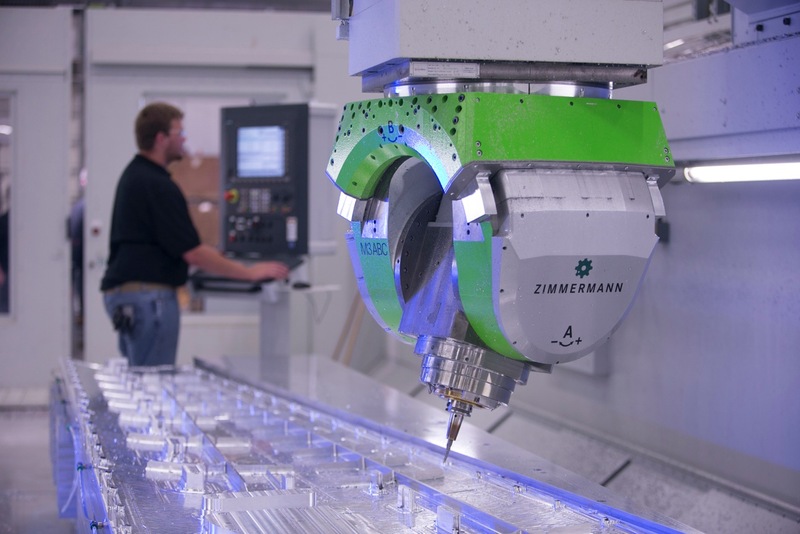 In operation, according to Harry Thurmond, the Zimmermann head design provides significant advantages in speed on the typical peaks and pockets found in aerospace structure machining, working in tandem with the look-ahead feature on the CNC. “It slows down and speeds up in anticipation of the next required surface contour. Over long run times, this can translate into an improvement of 35 percent or better, because there is no deburring or polishing required. We routinely get better than a 125 RMS finish on inside pocket surfaces and up to a 32 RMS on the outside of the Series 7000 aluminums we run. Combined with the flexibility of the machine to work a single structure or individual workpieces simultaneously, we have been quite satisfied with the results to date.” On longer runs, Thurmond adds, the chilled coolant used on the Zimmermann is helpful in minimizing thermal expansion of the material, a critical factor in long run machining work here. An added advantage, the machine is used to produce workholding and fixturing devices. Lastly, Harry noted that the Zimmermann machine is equipped with test probes, so it can be used as a CMM to measure workpieces in process. The 3-axis head avoids the pole position of the traditional 2-axis A-C head at A = 0º. In this Zimmermann head design, the B-axis moves +/- 15º inside a rigid curved guideway for handling the inner sloping and especially the pockets typically found on aero structures, so simultaneous 6-axis machining is achieved with high surface finish integrity. The new machine at Triumph Structures – Wichita is further equipped with a stationary clamping table, fixed mounted side walls, DemTec composite fill on the base and side walls for enhanced stability and vibration damping. Backlash-free drives on both sides with rack-and-pinion mechanisms are sealed from contamination and guided on both sides. All axes have feed rates to 60m/min and accelerations to 4m/sec2. Each head can access a 60-position toolchanger on the machine. For communication of data from the machine, Triumph Structures – Wichita integrates the CNCs into their Ethernet network via DNC and hard-wiring. Through a remote monitoring feature on the Sinumerik 840D SL CNC, Zimmermann is also able to maintain awareness of all conditions on the machine in real-time. At Triumph Structures – Wichita, design to CENIT CAM post-processor operations are done through Vericut simulation at the CAD station. 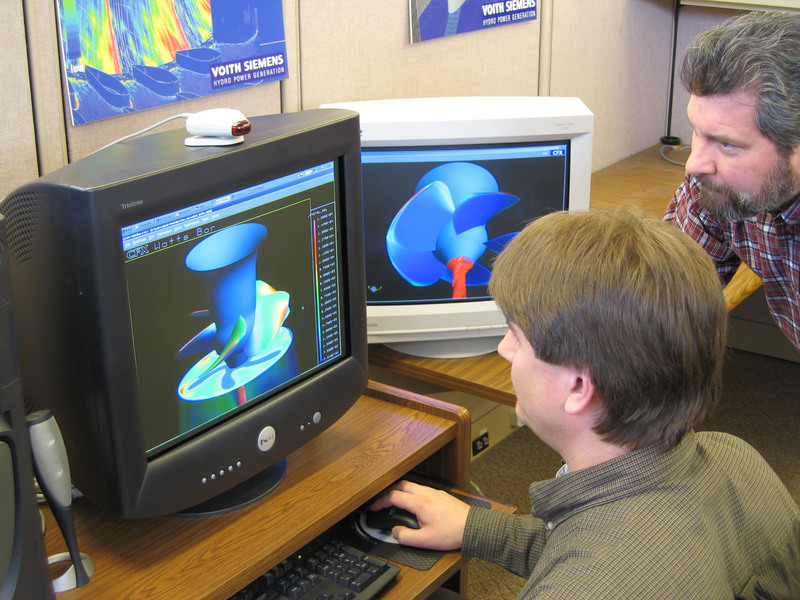 Harry Thurmond notes, “We had grown steadily over the last decades, since our incorporation of 5-axis work in the 1990s, and were ready to jump to a new level of competence for our customers, who represent the top players in both commercial and military aircraft, making Triumph Structures – Wichita a more value-adding supplier. Our part length capability had been 22’ here in Wichita and we were committed to expanding it, to compete in the 40’-80’ part ranges. 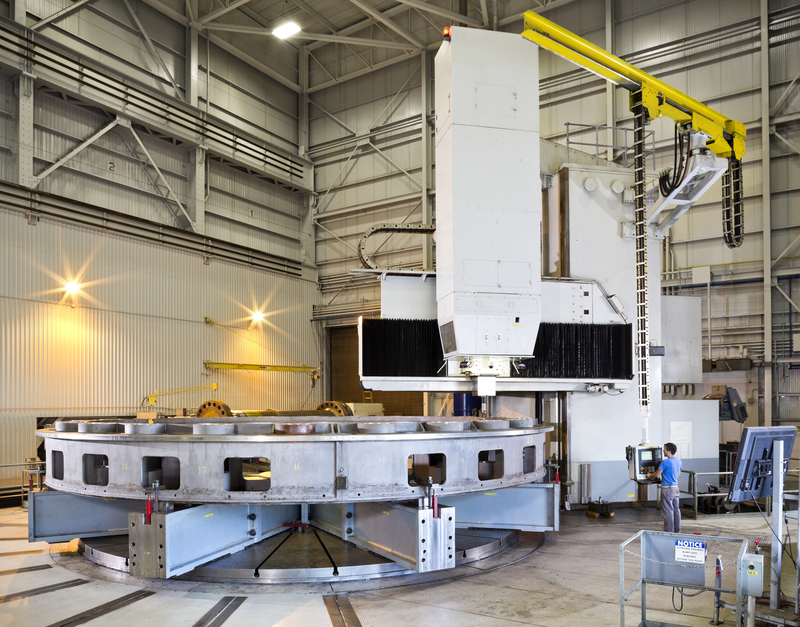 As with all aerospace structure machining, material removal rates are extremely high. We can start with a 5600 lb. workpiece that ends up at 100 lb., for example.” Harry further noted this means the machines at Triumph Structures – Wichita must be very robust with high-precision control of the cutting cycles, which often run for multiple days. Commenting on the CNC selection, Matthias Tockook of Zimmermann observed, “With all the challenges we had on this machine, including the axes of motion, the integration of the twin gantry movements, the substantial safety factors involved and the need for independent and also co-dependent gantry operations, we quickly determined that only twin Sinumerik 840D sl CNCs could handle this job.” The machine built for Triumph Structures – Wichita also includes Siemens servo motors and drives plus spindles running at 73kW/95HP and 27,000 rpm in operation. Triumph Structures – Wichita specializes in complex, high speed, monolithic precision machining and sub assembly of Aluminum and Titanium structural airframe components. Despite the large, heavy workpieces and frequent one-off production, Voith Hydro maintains a steady flow of work for its machining, typically holding +/- 0.002” tolerances on various carbon and stainless steels. Workpieces here often exceed 25’ in diameter. Voith Hydro in York, Pennsylvania is a major manufacturer of hydroelectric power generation equipment, especially the intricate turbines used in such operations, supplying hydroelectric generating companies and municipalities throughout North America. Over 12,000 units have been commissioned in the field with more than 65,000 MW of installed capacity, plus Voith Hydro has also upgraded over 600 existing power generation units. As a turnkey supplier to the industry, the company manages all phases of power plant projects, from analysis and planning, design and implementation, to commissioning and operation. Voith Hydro is ISO 9001 and ISO 14001 Certified. Milling, line boring and turning operations are performed on large multi-axis machine tools, most equipped with Siemens SINUMERIK 840D CNC onboard to control all axes of motion. 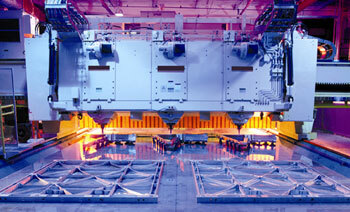 Voith Hydro maintains an impressive array of machine tools and multi-axis machining centers here. Despite a variety of builder brands, the majority of the machines have one common component, namely, the Siemens SINUMERIK 840D CNC onboard. Remote condition monitoring is performed between Voith Hydro and many of its machine tool builders to troubleshoot and resolve issues in real time, using the CNC on the machine. As Ward notes, “Our operators are quite comfortable with the CNC from Siemens and they use it for all motion control, plus the operator interface has the ability to afford us great troubleshooting capability and something else we value greatly, the commonality of the HMI on the control. That fact allows us to do a great deal of cross-training and that’s very important to us. We need to be highly flexible, given the one-off nature of our work here.” Most of the operators at Voith Hydro are capable of running multiple machines, while the maintenance personnel on his team can more easily service the machining equipment in the facility, adds Ward. He credits his machine builders and the Siemens team led by Howard Weinstein and Robert Stiefel for this ongoing flexibility. Part designs are run through the company’s CAM system and simulated offline to preserve machine uptime. Voith typically takes a customer design, runs it through their CAM system and simulates the cycle offline, in order to preserve valuable machine uptime. Since the work here involves highly complex geometries on the turbine sections, the simulation must be equally complex and account for all machine motions and collision avoidance. Once the program is finally determined for a part, it is fed over the Voith Hydro network to the appropriate machine tool or machining center for scheduling and production startup. During production, a system of real-time remote condition monitoring is available through the CNC for troubleshooting by both the Voith Hydro maintenance personnel and, when required, machine builder personnel, working offsite. Large Ingersoll milling machine was retrofit recently, with all new Siemens CNC, motors, drives and other hardware. 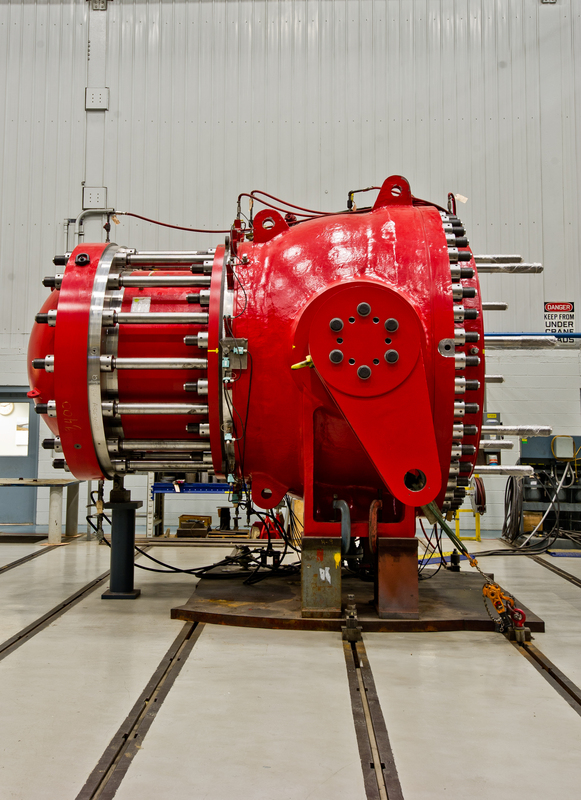 Voith Hydro in York, PA produces a wide variety of power generation components for various machine builders and municipalities across America. 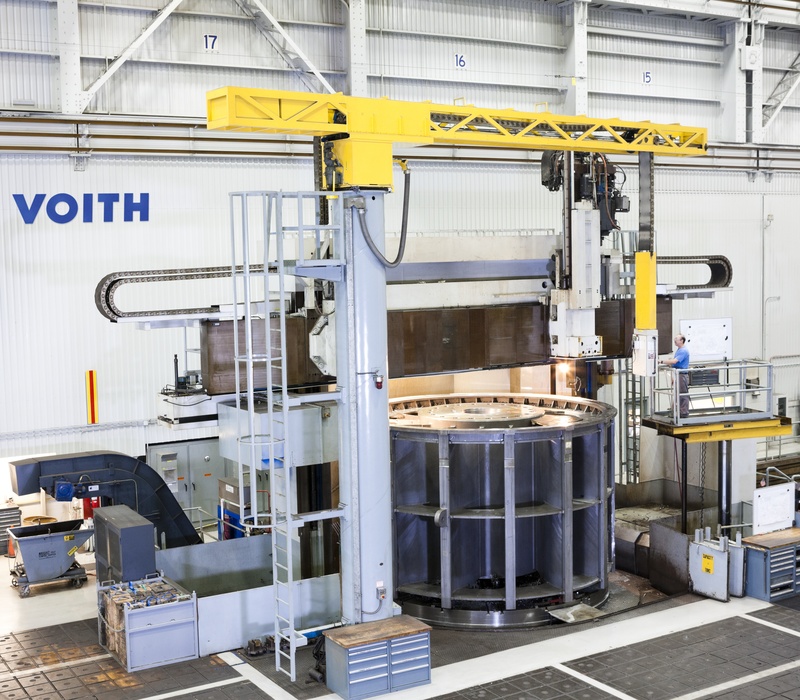 Voith Hydro boasts machining capabilities on workpieces over 42’ diameter and 350 tons at the York facility. Surface finishes are typically 250 and 125 Ra, though occasionally 64 or 32 Ra is required. 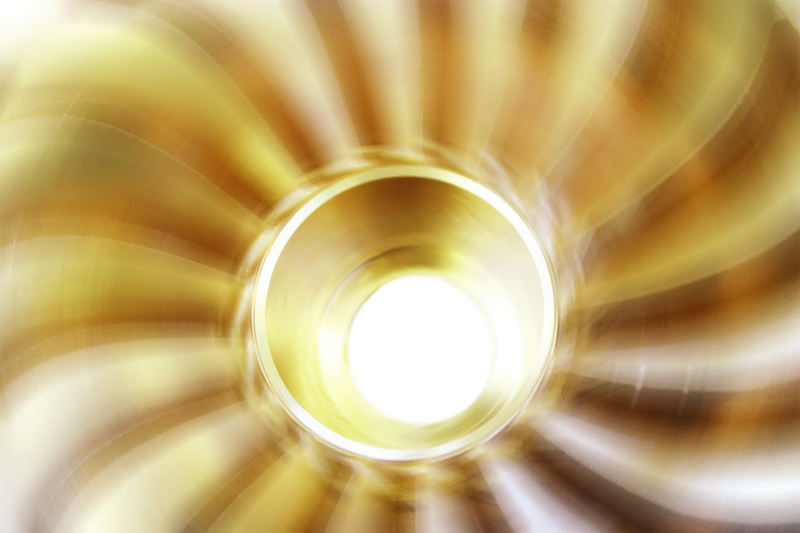 The finishes are achieved through both machining and secondary finishing operations, according to company sources. Fryer Machine Systems supplies an American guitar builder with milling machines for the production of high-quality guitars. Right-angle head compensation is essential to the accurate, repeatable milling of guitar necks — an easy task for the Sinumerik 840D CNC on board Fryer machines. The challenge of repeatable product performance is not new to C.F. Martin & Company. Six generations ago, company founder C. F. Martin Sr. was confronted with managing a guitar-making enterprise that was producing totally handcrafted guitars, one by one, with little means for standardization. Since those days, guitar legends such as Gene Autry, Eric Clapton, John Mayer and new-comers Ed Sheeran and Hunter Hayes have relied on ­the consistently distinctive tone, treble and bass specific to Martin acoustic guitars. When Martin learned that its previous machine tool builder had exited the market, the company turned to Fryer Machine Systems for new machines to cover a production increase and seized the opportunity to upgrade the control technology with Sinumerik CNCs. Larry Fryer (left) and Mark Bickert from Martin Guitar are satisfied with Siemens CNC technology, service and part quality. “We use right-angle head aggregates in our CNCs,” explains Mark Bickert, engineering project manager at Martin. 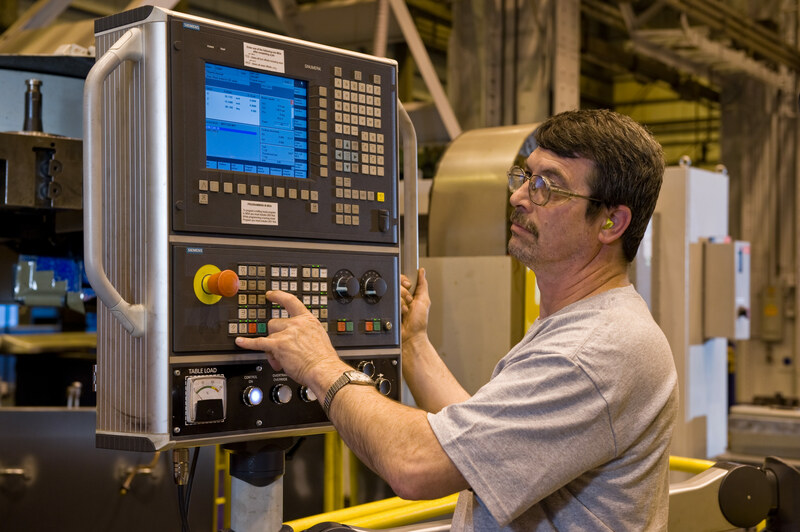 “We needed to find a machine builder that could give us right-angle head aggregate capability in conjunction with right-angle head compensation and a high-rpm spindle.” Fryer Machine Systems has earned a reputation for building reliable production machines that come with unexpectedly advanced features and functionality. The company happens to be the largest purchaser of Siemens controls in the United States, and the customizable aspects of a Fryer machine can often be attributed to the versatility of the Siemens controls on board. This time, however, Martin needed to be certain that the new Fryer machines would perform as expected. Right-angle head compensation is essential to the accurate milling of guitar neck components. 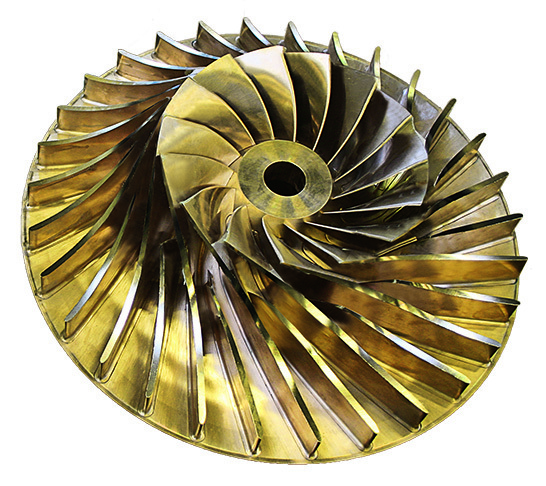 The function requires the sophisticated Sinumerik 840D sl CNC and ShopMill software from Siemens. Guitar image courtesy of C.F. Martin & Company. 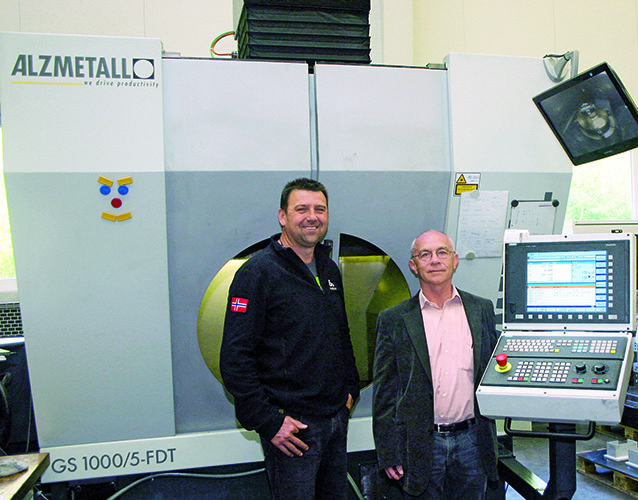 MCE Maschinen- und Apparatebau GmbH CEO Gottfried Langthaler (right) and Buz Bozner, head of the Alzmetall Technology Center, agree: The efficiency of the Sinumerik 840D sl makes an important contribution to enabling simultaneous milling and turning in every position with the GS 1000/5-FTD. Because this machine must also perform turning tasks, in addition to milling tasks, at MCE, this requirement is also in the specification and is met by the GS 1000/5-FTD. Buz Bozner, head of the Technology Center at Alzmetall, explains the technical basis: “We integrated torque motors in all round axes. We therefore achieve speeds of 300 rpm in the c-axis.” The mill-turn center offers an enormous machining space that not even standard lathes achieve. Parts with a diameter of up to 1,000 mm can therefore be machined. A highlight of the GS 1000/5-FTD is that it can be turned to any round axis position and level. The energy professionals in model construction have been relying on Sinumerik controllers since the mid-1990s because, according to the mechanical engineering boss Langthaler, these were always convincing, especially in complex five-axis machining: “The handling of Sinumerik 840D is also clear and simple on the ShopMill and ShopTurn graphical user interfaces.” The operator can work particularly easily and clearly when a GS 1000/5-FTD with the new Sinumerik Operate user interface is used. Operation and programming always have the same structure, regardless of whether milling or turning processes are to be programmed and set-up. The operator is also supported by graphical displays and animations. Many intelligent functions are available, which are helpful, among other things, for tool and workpiece measurement. 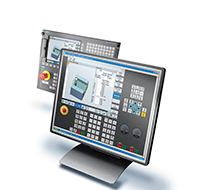 The operation and programming of 3+2 axis machining is also supported by the integrated Cycle800 functions. Animated Elements simplify the explanation of functions such as selection of the direction and free running, as well as swiveling. Another highlight of the new GS 1000/5-FTD is the Sinumerik MDynamics technology package, which is especially important for complex five-axis machining. Maximum surface quality and exact contour accuracy can be achieved even more rapidly. The key is in the new Advanced Surface intelligent path control, which contains an optimized look-ahead function and an optimized online CNC data compressor, among other things. The integrated intelligent jolt limiter relieves stress on the machine mechanics because it enables gentle acceleration and deceleration despite extreme dynamic response. As a specialist in single-part and small-series production for small to large workpieces, MCE is equipped to meet even extraordinary demands on-time and with top quality. By equipping its machines with state-of-the-art Siemens technology, the company is able to achieve high throughput times in model production and pass these advantages on to its -customers.